B E R L I N is a city exploding with contemporary art and artists alike. The gallery scene differs quite a lot from what we have in New York, but if you are willing to grab a bicycle, a trusty map or some local friends, the galleries will entice with good editing and an active dialogue not only with the present but also with the environment in which it is being shown. Many Berlin galleries are sizable and can easily exhibit more than one show at a time. Such is the case with Sprüth Magers as well as Contemporary Fine Arts (known to most as CFA). Since winter of 2011, I have invested and will continue to invest time reporting on the Berlin art scene. Recently after making the rounds during Berlin Art Week, I remained in the city for an additional two weeks, allowing for studio visits, a personal gallery walk-through and a stop by at a several museums. Below is my TOP TEN for Berlin in the month of September, two thousand twelve. First up on the list is an exhibition by Berlin architect Arno Brandlhuber titled Archipelago. His first solo show in a gallery context, Brandlhuber has been a regular fixture at the Venice Architecture Biennale (2012, 2008, 2006, 2004) and also designed a Pavilion with artist Thomas Demand for the São Paolo Biennale in 2004. For his exhibition at Neuer Berliner Kunstverein (NBK) Brandlhuber utilized holes in the gallery ceiling from a previous exhibition and poured cement into the space allowing for a spatial intervention. 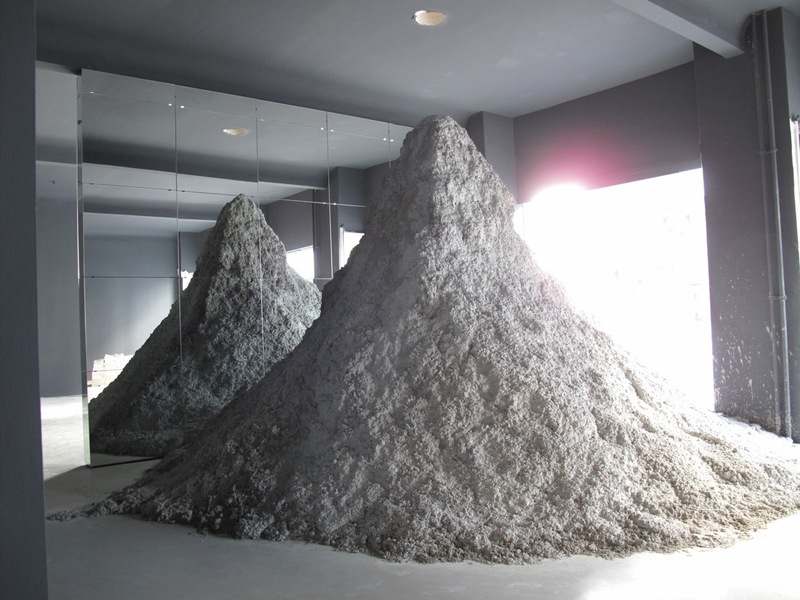 The cement is present throughout the gallery sometimes in what could be described as enlarged ant holes or flattened organic mounds while bits of cement decorate the nearby walls and mirrored surfaces. The strength of these works lies in the shear, weighted mass and also the illusion of happenstance even if the works somehow feel quite controlled. NBK, at least for Archipelago, didn’t use any fluorescent lights and the natural, dim, cool gray sheen filtered in from the large street facing windows somehow assisted in leaving an impression of other worldliness. It’s refreshing to see work made by an architect, such inspired, non-functional structures. Arno Brandlhuber, Archipelago, is on view at NBK from September 8th-November 4th, 2012. Next up on the list is Mike Nelson who as an installation at a location in Mitte associated with neugerriemschneider Galerie. In the main space is work by Simon Starling, including two videos and free-standing sculpture. However, for the more adventurous, Mike Nelson has intervened upon an abandoned space a few streets away from the main gallery. As with most of Nelson’s work, it is up to the viewer to discover the naturalistic details imposed upon an otherwise quiet locale. The first section allowed viewers the opportunity to enter a space that appeared “empty” and then proceed down a rickety, wooden staircase. sans signing a release form (impossible in the US). The second location, also enter at your own risk, presented a larger staircase leading up, rather than down. After climbing a few floors and walking through a dusty, crooked door, it is evident that we have landed on the stage of what appears to be a long ago forgotten theater, dark in it’s years of disuse. How odd for a theater, including a decorative wooden balcony and stage, to be present in not only this particular abandoned building, but also on the 2nd floor. Immediately one is reminded of the diverse, complicated history of Berlin. Was the theater used during the DDR (Deutsche Demokratische Republik 1949-1990)? Was it a glamorous hall occupied by the Nazi’s in WWII or could it have been a shelter, a place of respite for families of Jews who were in hiding throughout the late 1940s. In fact, Mike Nelson constructed the stage himself, lending it to the mythology and mystery of time passage. 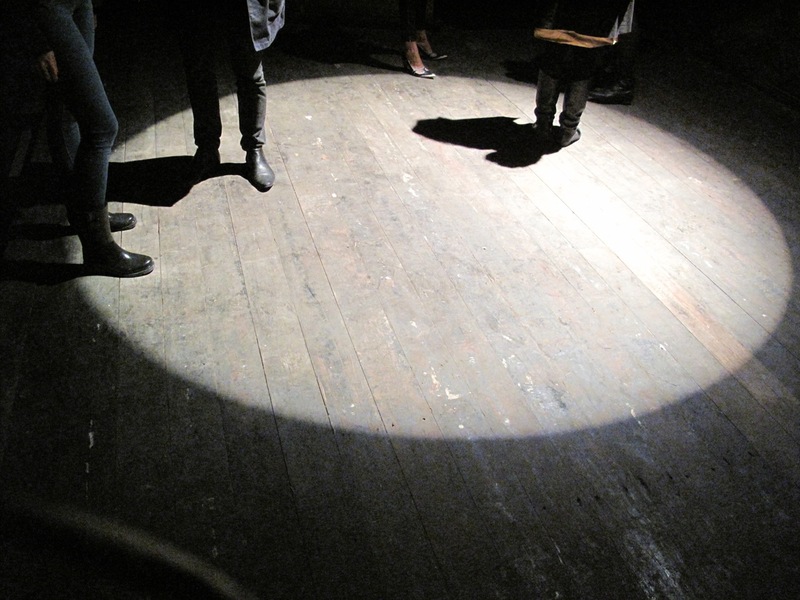 One particular, abnormal detail we are given is a spotlight, beaming onto the stage. Nelson has chosen to include us, each viewer to enter the room in his own theatrical performance, void of construct, but ripe with a magnitude of imaginative possibility. Mike Nelson, Space That Saw (Platform for a performance in two parts), is on view as part of neugerriemschneider Galerie from September 15th-October 13th, 2012. An exhibit at the Hamburger Bahnhof titled Cy Twombly and the School of Fontainebleau, featured a selected of artists and is part of the Marx Collection, on view in Kleihues Hall until October 7th. The group exhibition featured works by Cy Twombly, Anselm Kiefer, Robert Rauschenberg, and Andy Warhol, curated by Eugen Blume with curatorial assistance by Matilda Felix. When Hamburger Bahnhof commenced, it’s permanent collection was started with work belonging to the Berlin entrepreneur Dr. Erich Marx. The special temporary exhibitions in the cavernous main hall which was the “Bahnhof” amongst other locations seem to be the most appealing. However upon this visit, a friend convinced me otherwise and it was actually quite refreshing to see work from the permanent galleries, including Warhol’s that I hadn’t witnessed in person previously. What the curator has done with access to the art from the Marx Collection, is to assimilate a particular narrative of sorts by hanging certain works within the range of others. 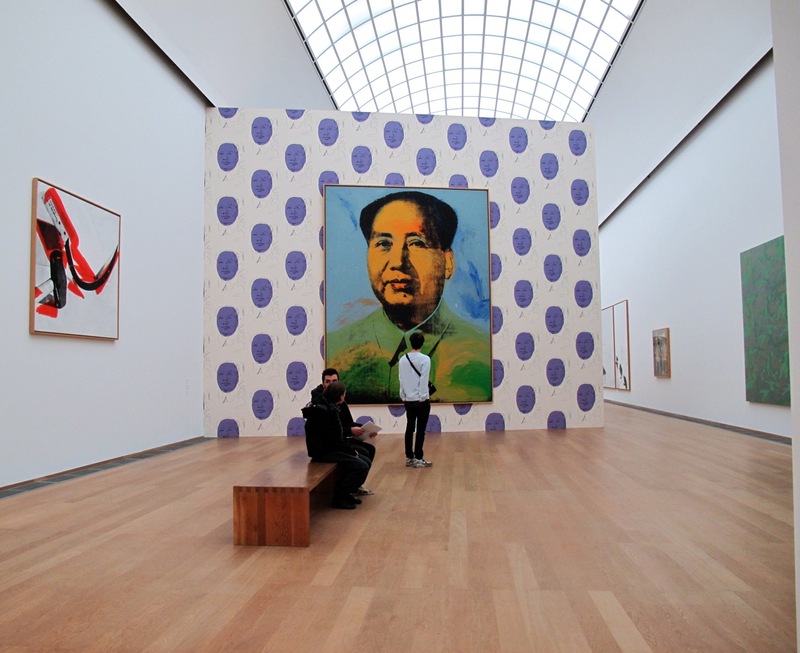 Warhol’s “Mao” from 1973 is often a permanent fixture, however, upon a google search, the silk screen is normally not accompanied with the purple wallpapered background and it is this particular color story addition (along with scale) that made the work stand out. Side note: the extensive Joseph Beuys collection is also not to be missed! Another museum that is hosting a contemporary, however singular work exhibition, is Neue Nationalgalerie with Paul McCarthy: The Box. The museum has a collection that dates from the nineteenth to the twenty-first centuries and also occasionally hosts a contemporary exhibition. Upon entering the expansive museum lobby, The Box, stands out like a sore thumb. It is constructed of ply wood and stands probably 25 feet high. The piece, dating from 1999 contains items from the artists studio, labeled and reinstalled at a 90 degree angle to the floor. When peeking inside, the reality of the situation is in a state of lopsidedness and the viewer has to tilt his or her head to understand the context of the room. The work is very different from any I have seen by McCarthy, whose art usually contains a particular level of perverseness. This work was oddly satisfying and rare glimpse into the working space of an artist. Favorite element, a box labeled “spare Santa clothes”. 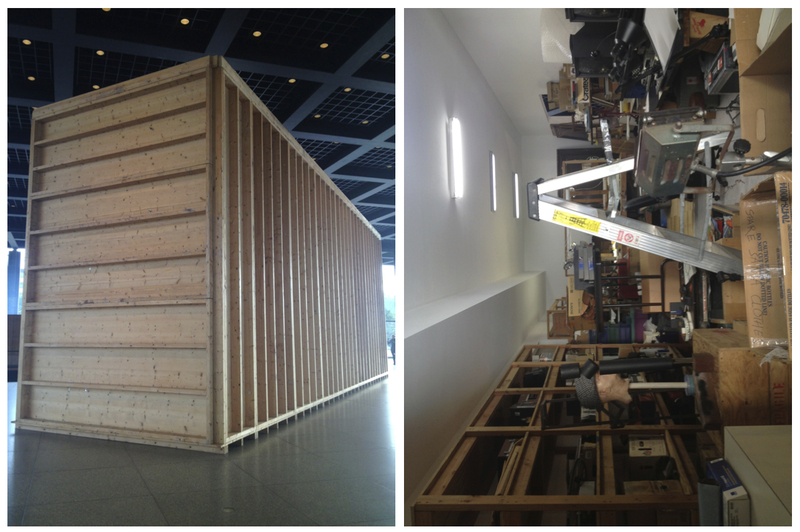 Paul McCarthy: The Box is on view in the lobby of the Neue Nationalgalerie until November 4th, 2012. Douglas Gordon was recently awarded the Käthe Kollwitz Prize at the Akademie Der Künste in Berlin. Also, on the occasion of the award, the artist is showing a cumulative work from 1999 titled “Pretty Much Every Film and Video From About 1992 Until Now”. The piece features a series of videos including important works such as “24 Hour Psycho” (1993), “Play Dead Real Time” (2003) and “Henry Rebel” (2011) to name a few. 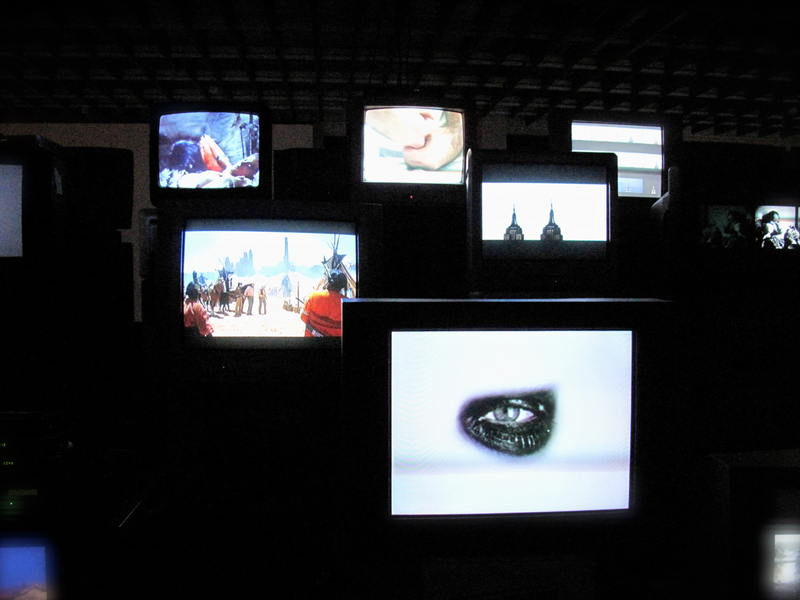 In total, there are 74 film and video works being shown on basic t.v. monitors propped on stacked beer boxes. The display is a cacophony of sound, changing images, and nostalgic content from a long career. Installed for the second time since 1999, the work has grown exponentially and Gordon has added videos to the mix as his work has expanded. The way in which the work is displayed reminds me of a more condensed version of Maurizio Cattelan’s ALL on view at the Guggenheim in New York, autumn 2011. By reducing the scale of the videos from a large screen format and placing them within the confines of small television sets, the artist is able to participate in the deconstruction of his own practice. Something which Cattelan did with ALL and somehow removes the preciousness that one can be aware of when looking at a particular artwork. Douglas Gordon, “Pretty Much Every Film and Video From About 1992 Until Now” is on view at the Akademie Der Künste until November 4th, 2012. Another award winner (Prize of the National Gallery for Young Art , Germany, 2011) who also happens to be based in Berlin, is French born artist Cyprien Gaillard whose exhibition titled What It Does To Your City is on view at the Schinkel Pavillon and opened on the occasion of Berlin Art Week. The show includes an installation of metal objects (the “teeth” from large diggers) and a performance that featured the machines in a ballet of sorts. A short video documentation of the performance is online, click here for a link. By exhibiting the “teeth” of these machines, the artist chooses to glorify an object not necessarily from our past, but rather from our present. It is an object necessarily for urban growth and development, something quite relevant for the changing Berlin landscape. Yet, these small kernels, elements that equal a bigger whole, only function when part of the machine from which they came. The dynamism of possibility or of the absurdity of monumentalization of banal objects, is the key of the exhibition and once again, not staying loyal to a particular medium, Gaillard almost always offers a pleasant or at least unexpected surprise. What It Does To Your City, by Cyprien Gaillard opened on September 13th and is on view until October 21st, at the Schinkel Pavillon, Berlin. 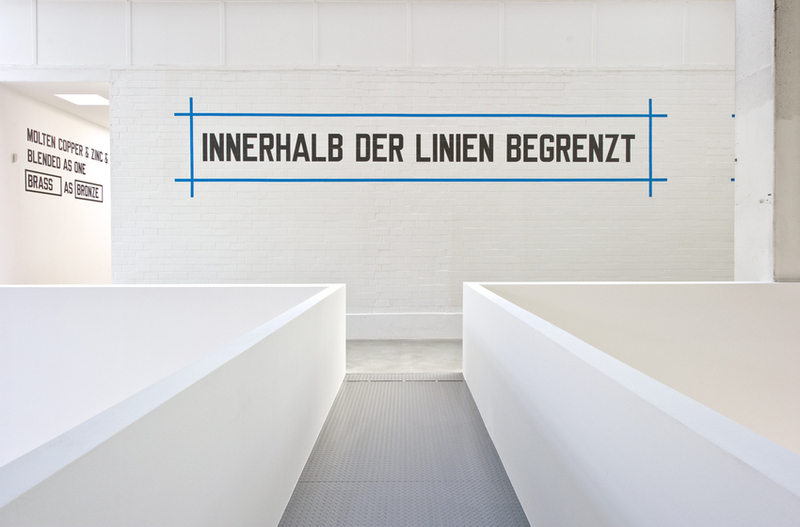 On view at Blain Southern, a gallery that is a recent addition to the Berlin scene having just been located on PotsdamerStrasse for about a year now, is Lawrence Weiner Concentricity Per Se. Lawrence Weiner has been a fixture in New York and on the West coast, so it was refreshing to see his enlarged text based works mixed in both German and English phrases. The work is a testament to language and communication. Here, both German and non-German speakers alike can look at the graphic quality of the work as it communicates something that is either comprehended or not. Not unlike an organized version of graffiti or the slogans we are fed through advertisers, Weiner’s text works are bold and not easily ignored. Blain Southern is huge and the high ceilings and spacious second floor are made to well curated. Kudos to the staff for not overwhelming the space with works but rather installing a particular amount of works, that is what Per Se seems to be all about working with particular restraints. Lawrence Weiner Concentricity Per Se, opened September 15th and is on view until November 3rd, 2012. For her third solo exhibition with September Gallery, artist Larisa Fassler, Palace/Palace focuses on architecture that she sees on an almost daily basis. Here she takes aim at the demolition of the Palast der Republik and the planned reconstruction of the Berlin Stadtschloss (Berlin City Palace that was destroyed by the GDR in 1950). 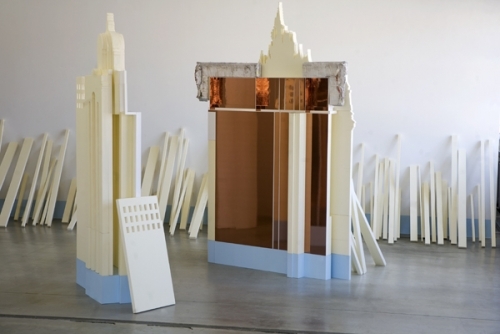 Using light, almost anti-architectural materials, she makes versions of the structures that exist and are yet to be rebuilt after being destroyed. Fassler, originally from Canada is based in Berlin and often looks to the landscape and sometimes even unglamorous parts of her environment that are usually go unnoticed. For Palace/Palace, she juxtaposes the castle from Disney’s Cinderella movie with that of the Berlin Stadtschloss Her point of view questions what is real. Many in Berlin have scoffed at the rebuilding of the Berlin City Palace since what is in the past, should remain in the past especially in a city so ripe for urban focus and development. The reconstruction of a historical building will not resurrect the history that it took with it when knocked to the ground. However, as Larisa Fuchs suggests, sometimes as with Cinderella, it is the beauty that we seek and authenticity isn’t always a requirement because maybe the truth is held in memory alone. Larisa Fassler, Palace/Palace opened on September 11th and closes on October 13th, 2012. During Berlin Art Week, Alfredo Jaar had the luxury of showing work in three different venues for his exhibition, The way it is. An Aesthetics of Resistance. A retrospective divided into three parts, was shown at NGBK, Berlinische Galerie and Alte Nationalgalerie. The exhibition partially referenced two of the artists past projects that also took place in Berlin titled “Eine Ästhetik zum Widerstand” (“The Aesthetics of Resistance”) and “The Way It Was” both which were shown in the early 1990s. At the Berlinische Galerie, Jaar’s work focused on the atrocious genocide that occurred in Rwanda but is work that was made when the artist was based in Berlin (he is now based in New York). The exhibition at the Berlinische Galerie ranged from video portraits to photographs inscribed with text, some in German, some in English. His goal for this part of the Retrospective was to challenge the viewer by also involving them in a physical or psychological situation, hoping to bring each person closer to an experience that they are lucky they didn’t have (in this case Rwandan genocide). A particularly strong piece in a three channel video featuring President Clinton on a 1998 visit to Rwanda, acknowledging the severity of the genocide in a work titled “We Wish to Inform You That We Didn’t Know (2010)” and the failure of a global reaction. As the former President declares “It may seem strange to you here, but all over the world there were people like me sitting in offices, day after day after day, who did not fully appreciate the depth and the speed with which you were being engulfed by this unimaginable terror.” With each proclamation ending in “..people like me..” Jaar freezes the screen until all three are still. The work is both eerie and compelling. In the context of the exhibition, the viewer was forced to invest some of his or her time in order to experience the work in a way that was not necessarily comfortable. Alfredo Jaar, The way it is. An Aesthetics of Resistance, was on view at Berlinische Galerie until September 17th, at Alte Nationalgalerie until September 16th and NGBK until August 18th, all 2012. Right: Eva Maria Salvador, “Untitled” 2012, Photograph, 60 x 80 cm. The team behind Berlin Art Link have been collaborating with Sur La Montagne located on Torstrasse in Mitte, for a series of exhibitions they categorize as their Night & Day Series. 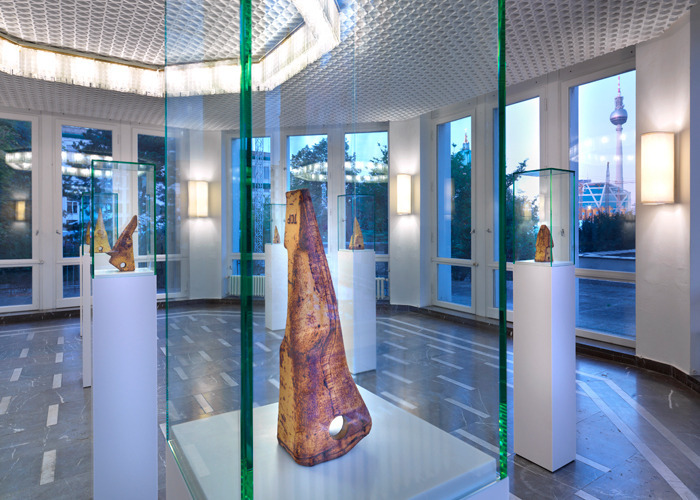 Coinciding with Berlin Art Week, John Kleckner and Eva Maria Salvador exhibited their work side by side. 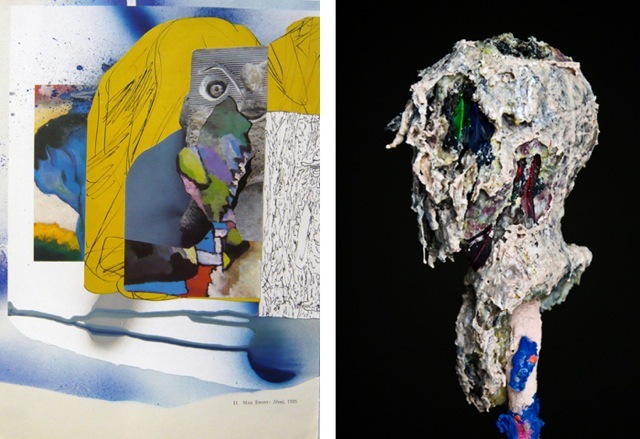 As a two person exhibition, their work was almost seamless and harmoniously filled the space, different in technique and choice of medium, but similar in visual aesthetic. Each artist seems to look at the human form as if through a waxy lens. Shapes are organic and unfamiliar, almost scientific in nature. They both have a similar color palette as well, focusing on grey undertones and then allowing some royal blues, purples and the occasional hint of fuchsia to peek through. If the body is a focal point, the removal of information, flesh, structure and form appears to the goal for the end result of each piece. Both Kleckner and Salvador leave most interpretation up to the viewer however, one can’t help but seek out some conscious familiarity within the otherwise abstract shapes. John Kleckner and Eva Maria Salvador, was on view at Sur La Montagne from September 15th until the 16th, 2012. Catch the Night & Day Series while you can!